I just got a call from the high school where I sub that our PE teacher and his wife and expecting their new baby girl today! What a wonderful journey they are about to begin. It seems like such a long time ago that my 8 and 10 year olds were babies. Ahhh, that new baby smell. Anyway, this card was commissioned by a teacher friend for the special occasion. I'm using a Wordsworth stamp called Baby. 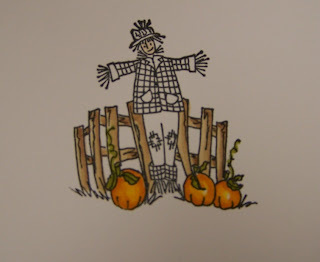 I just love the fun stick people that Wordsworth comes up with, they are so cute and EASY to color. You will be seeing a lot more cards from Rubber Soul and Wordsworth because I just started some blogging work for Dani and Fred. I met them at CHA and they are delightful folks! When I received my goody box from Dani and Fred at Rubber Soul, they sent a fun collection of stamps for me to give away. It was like Christmas! And I get to share with you guys. 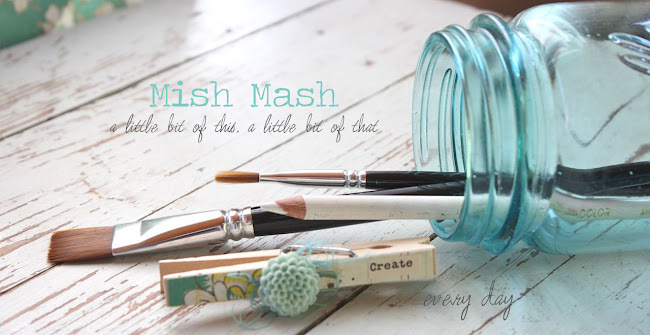 So in honor of the new baby, I'm giving away my first blog goodies! If you are the lucky winner, you will receive the Baby acrylic set and some fun baby embellishments shown below. All you have to do is leave a comment with your name and tell me one of your favorite childhood memories. I think my fondest memories as a child was growing up with my mother at home. She was always there to greet us when we got off the bus and we never had to go to a babysitter. She always had some homemade goodies as treats and we got to play outdoors for hours and hours until Dad got home from farming. Those were GOOD days! I will select a winner on Saturday evening so be sure to leave a comment and feel free to tell your friends! I will ask the winner for an email address so that I can contact you for a mailing address. And a big THANK YOU to Dani and Fred at Rubber Soul for the wonderful opportunity they have given me!!! Copic Marker Coloring Tutorial....and a cute card! Okay my peeps, here's what many of you have been waiting for. A Copic Marker coloring tutorial. Have you got some Copics yet? If you love to color stamped images, then YES, you need them! Head to Ellen's store and she will hook you up with what you need. And don't forget the Colorless Blender! She also sells the Airbrush System and the cool Copic Spica glitter pens. So here we go on the tutorial. I'm using Karen Lockhart's cute Scarecrow stamp. The detail is small so this tutorial is about coloring smaller, multi color areas. You will learn lots of different coloring techniques so you might want to take notes. I hope you enjoy! Okay, so I've got my image stamped, heat set and ready to go. I'll start with the pumpkins first. This technique is done by blending similar colors together on the paper. I start off by coloring my pumpkins in with a light color yellow/orangy marker. Always leave a white space when coloring objects that have dimension. This will give the effect of highlight or a light spot. Next I color the outer areas of the pumpkin in with a darker orange color. You now will see three colors basically on the pumpkin: white, light orange, dark orange. Next I take my lighter orange color and color over the darker area to blend the two oranges together. Any marker can act as a blender pen. Just remember to use the lighter color over the darker color to blend the two together. I still left hints of those white spots for a nice highlight. I colored the pumpkin stems in green and they are done. Next I move to the fence. For this coloring technique, I colored the fence planks in with a tan marker all over. I then took a darker brown marker and scribbled some ink onto a CD case. 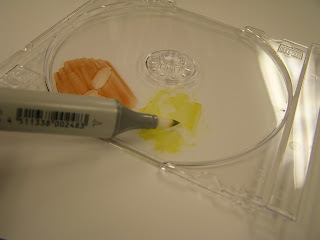 Lay the CD case over the color of the paper you are coloring on so that you can get a good idea of what the colors will be. 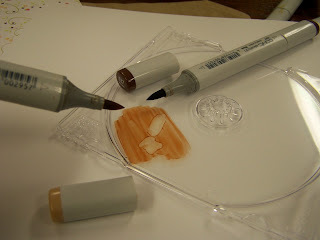 Then I took my tan marker that I colored the fence in with and picked up some of the dark brown color off of the CD case. Just like using a paint brush to pick up paint medium. I used this to shade in the darker brown on the fence planks. See photo above. Notice that I paid attention to my shadows and that all of the shadows on the fence fall to the right. This means that my light source is coming from the left. Lighter on the left where the sun might be shining and darker on the right where the shadow is. You can pick up more color as needed from the CD case. If it's too dark, you can scribble a little off on some scrap paper. Clean the tan marker when done cleaning to remove the darker brown ink. My tan marker is now back to it's original color. 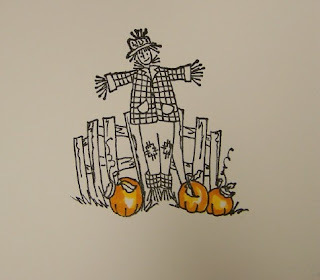 Next I colored in the scarecrows pants. I wanted him to be wearing some old farmer's jeans so I colored them a denim blue color. I simply colored them in solid then went back over the areas I wanted to be shaded with the same color marker. I love that you can use one color of marker to get darker shades. Just keep applying layers until you get the desired shadow. Notice again that my shadow falls to the right and a little bit under his shirt. 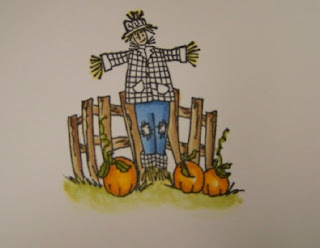 Then I moved onto the grass under the pumpkins. I once again scribbled a green color (looks yellow in the photo) onto the CD case. Then I took my Colorless Blender (same type of sketch marker but it just has clear ink) and picked up some of the green color. I color directly onto my image with the blender pen and kept adding color til I got the look I wanted. I then wiped my Blender Pen clean onto a scrap piece of paper then continued to blend the grass out. See above photo. 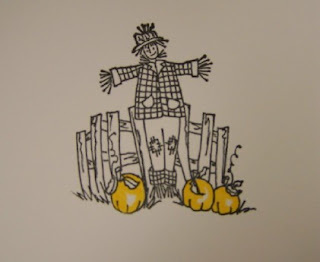 Next I colored the scarecrow's shirt. Of course he had to have an old flannel plaid shirt, right? So I colored the burgundy stripes of the shirt following the lines on the image. Then I went in with the same color tan that I used on the fence and colored in the entire shirt. I went over the plaid lines to soften the look of the burgundy marker a bit. I also colored in the face, hat and straw hands and feet with markers. 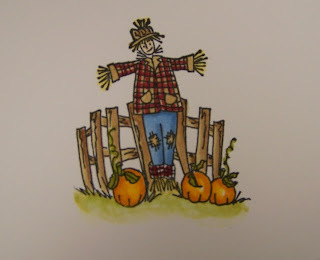 Lookin' good, Mr. Scarecrow! Now this is what really finishes off the colored image, in my opinion. I gave the image some depth by adding in a colored sky. Take a look at the photo above compared to the photo below. Doesn't the blue sky just make all the colors pop off the page. I thought so too! I do this with a lot of colored images just to get this cool effect. You don't have to color in an elaborate sunset or a whole sky either. Just a hint will do. To do this, I usually use a B00 or a B000 and simple outline around the colored image and in this case I colored in the spaces between the fence too. Let this set for a minute so you can see what the color ends up looking like. Then I take the beloved Colorless Blender and just blend the blue color into the white, fading it out so that there are no definite lines. Voila, now my image is finished! You likey? Here is the finished card I made. I took my colored image and die cut and embossed it using the Wizard and a Spellbinder's Scallop Square Die Template. No extra matting was needed because the image stands out so nicely. For the card base, I used a Memory Box notecard and four pieces of Rubber Soul patterned papers from the Garden Variety 8 x 8 collection. I added some twinkle sequins to some flower centers for a little bling. 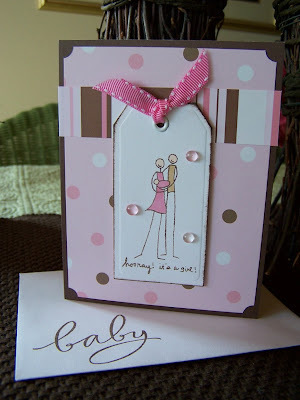 A cute polkadot ribbon finishes off the card. I hope you learn a LOT from my tutorials, I am more than happy to do them. I just love these Copic Markers so much and I want you to be able to use them and get the desired look you want. So have fun and let me know if you are a Copic addict like me!! Ellen has markers back in stock but they are selling out as soon as she can get them in. So place your orders today, don't forget the Colorless Blender and have fun!! Tip of the day: To create the patchwork design on the card, simple cut two card fronts of patterned paper and then cut it into four pieces. In this case, I liked the flip side image so I used that. Then you have enough 8 pieces which will be enough for two card fronts. Just place them back into place on the card front like a puzzle and adhere. It's a good way to use more than one pattern on a card but it still has a nice clean look. Are you scared yet? Well you better get ready because I'm in the mood for Halloween! 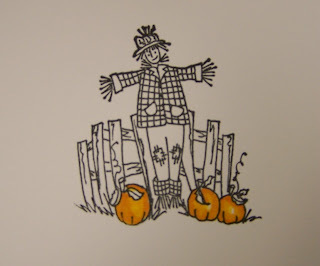 I love it when Fall comes around because I start thinking about ghosts and goblins and warts and witches too! 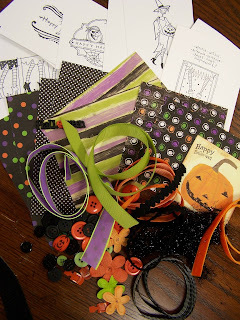 So get ready for lots of Halloween projects this year....I think I lost my mind because I have a TON of Halloween stamps and goodies to use. I got a little obsessive, you could say. So here we go with a bewitched sample. 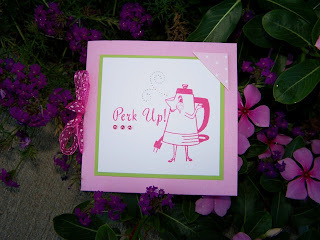 My good friend Emily over at Stamping Bella gifted me with some fun new images. I immediately knew I needed this cute witchy poo stamp, isn't she cute? First, I stamped my image in black ink, heat set then cut out and embossed the image with a Spellbinder's Oval Die Template. That image was matted on a scallop cut Spellbinder's oval. I colored in Witchy Bella with my Copic markers, using a direct to paper coloring method. I colored just like you would in a coloring book then went back over areas with the same color markers to add shading. Then I took my Copic Airbrush System and created a spooky Halloween sky. First I masked the colored witch with some Eclipse masking tape. 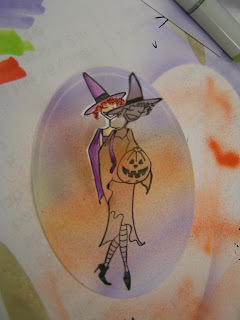 Then I selected some spooky sky colored markers-a purple, a green and an orange color. Then I airbrushed each color on in back and forth sprays, switching markers for each of the three colors. When I pulled the mask off...which is SO fun...the spooky sky appeared. So how bout that? 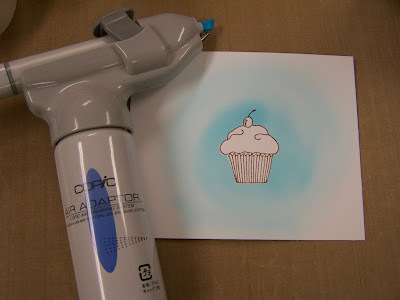 For more information on airbrushing with Copic markers and the Airbrush System, visit Ellen's blog. She did gave some *technical* tips on how to operate the airbrush system. To finish off the card, I used some SU! 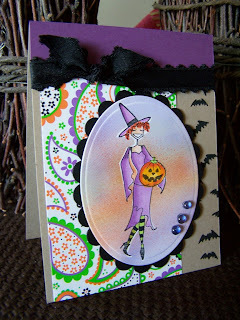 tiny bat images in black, Doodlebug Halloween patterned paper and I tied some May Arts ribbon around the card. Notice that the tied ribbon portion looks like bat wings! I planned that part, so clever yes? I also colored the pumpkin's grin in with a gold Copic Spica glitter pen, they are fabulous!! And the grand finale are those three purple beads. My daughter Jordan called them *witchy warts* so that's my new name for them! Actually they are what Emily at Bella calls *baubles*. They are fun! So I hope you enjoyed the first of many Halloween projects. You realllllllly need to try the airbrushing, it's addicting and you'll want to airbrush everything in sight! What's this you ask? This is a little goody sack I sent to my good friend Pine. She loves Halloween too and she makes the BEST Halloween goodies. I can't wait to see her creations this year! 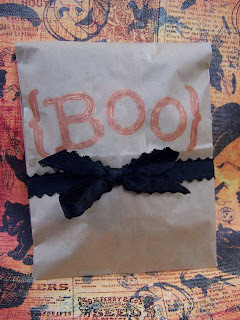 Inside her goody sack was all kinds of Halloween stamped images and embellishments. I hope she has fun using this stuff and hopefully she'll post some of her goodies on her blog. Do you have some good *stuff* sitting around? Tip of the day: Stamp some images, cut some snippets of fun ribbon and patterned paper and send it off to a stamping friend. Challenge them to create something fun...it's fun to share! Actually I was in a jam......making homemade jam that is! Every year when the peach trucks come to town, my mom and I know it's jam time. We have a secret recipe for Hot Peach Jam and my friends usually start asking for it about now. My mom was always canning some type of fresh fruit or vegetable and I love that I'm carrying on that family tradition. But I still need her help because she's so good at it. So she comes over with her water bath equipment after I have my jam mixture all ready. She's a lifesaver! So I wanted to make her a card but didn't have a Hot Peach Jam stamp, imagine that (Karen can you work on that for me? LOL!) So I searched my stamp collection and thought that Karen Lockhart's jar of pickles with the sentiment *I was in a pickle and you helped me out.....* would work just fine. We've canned a lot of pickles in our day too, I must say! 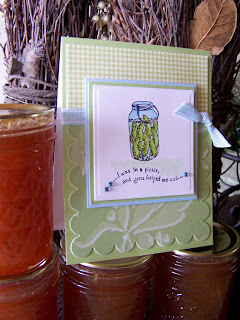 So here are two versions of my pickle jar cards. 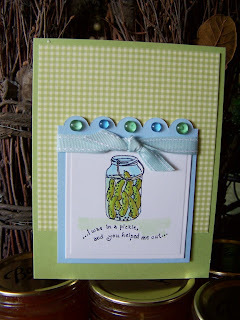 For this first card, I colored the pickle jar in with Copic markers, using just a few shades of green to color the pickles and then a light blue for the liquid/jar color. Very simple and clean. 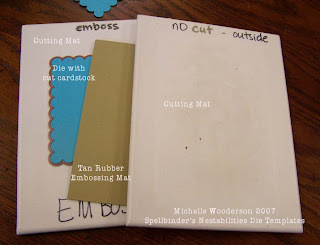 I then cut and embossed my image with a Spellbinder's Rectangle Die Template. The background papers are from the Homespun Memory Box Collection. 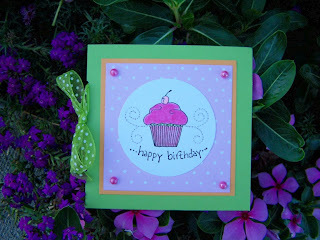 I used my largest Spellbinder's Square Scallop Die Template to make the bottom portion of the card. The gingham check was adhered to the top and a SU! ribbon hides the two patterned paper *seams*. Three little sequins were added to the sentiment for some bling. This main image on this card was colored in the same fashion as the first card and was also cut and embossed with a rectangle Spellbinder's Die Template. For the blue mat, I cut a rectangle with my paper trimmer then inserted only one end into my die template so that just one side would get the scallop cut. I learned that trick from Nichole Heady at Papertrey, she's SO clever! Flat beads and SU! ribbon were added for embellishments. 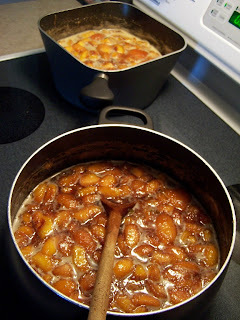 I thought you might like to see our Hot Peach Jam process. First I blanch the peaches in boiling water, peel and then cook down with all the secret spices for about an hour. I did a double batch on this day. 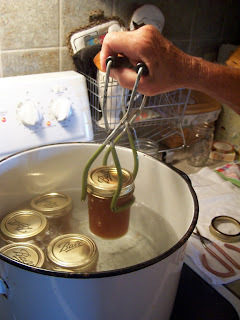 Then we prepare the jars, lids and rings and give our prepared jam a water bath to seal the jars. I took this photo of my mom's hand while she was removing some jars. She works so hard and her poor hands are showing the signs of it. I will always love this photo. Then it's my turn to go to work. 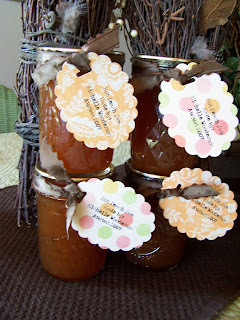 I can't leave those cute little jars just sitting around naked! So I fancy them up with ribbon and a cute tag. I punched those with a Marvy punch after printing on My Mind's Eye patterned paper. I used the SU! horizontal slot punch and then tied to the jar with brown May Art's ribbon. I'll take my first order to school on Monday, my friend ordered three jars. I'll probably make at least two or three more batches while the peaches are still good this year. Cut cardstock cover for notebook 8" x 10". Score a short end at 1" (this section will be adhered to the back of the notebook with sticky strip, I usually don't cover the entire back). Then continue to wrap and score the cardstock around the book. You will have a "spine" which will be less than 1/4" and then the front should be 5". You will continue folding the remainder of the cardstock and will end up with a pocket on the inside(see photos of inside cover on that post). Cut the inside portion at an angle to make a pocket. The bottom of the pocket will also be adhered with sticky strip. I also adhere a piece of cardstock to the top of the journal to make it look *finished*. Sticky strip works best....redline tape...it holds forever! By using this tape though, the notebooks are not refillable. Hope you enjoy! Edited to add: The Crafty Secrets Tea and Coffee set can purchased right here at Crafty Secrets! It's a good set to own!!! Edited to add: Dottie suggested using the pocket cards for sending stamped images to friends. Great stamping minds think alike.....because I meant to post that and forgot, but I think that would be a GREAT idea!! Stamp whatever image is on the front of the pocket card and send them off to a friend. Thanks for sharing Dottie. Note: I will post directions for the junior note pads later, I promise! Gotta get ready for my first sub day on Thursday!! In the meantime,these are some fun little projects that I made up this summer. They are square cards that open up with two pockets inside. They're very simple to do so I hope you try them out. Directions: Cut an 8-1/2" x 11" piece of cardstock to 8'1/2" x 6-1/4". Score the 8-1/2" length in half at 4-1/4". Score the 6-1/4" lenth at 2". Fold on score marks. You will end up with a 4-1/4" square card. See bottom photo for what the inside looks like. 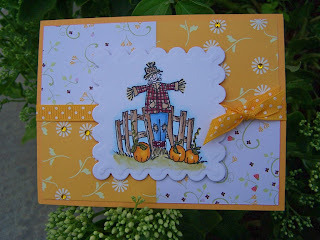 Decorate the front as desired, punch two 1/8" holes on the card fold and tie up with some pretty ribbon. This first card uses a favorite image of mine from the Crafty Secrets coffee and tea set. This adorable coffee pot is begging to perk someone up! I used the Ornare piercing template from Ellen's store to make a little steam and then colored over with Copic Spica glitter pens. Soooo shimmery. Three little pink decorative pearls underline the sentiment. You can pick up those at Ellen's store too. May Arts ribbon. Now check out this cute little number. Another favorite image of the Lockhart collection is the Bouquet stamp. I think I've used it for every occasion...except a wedding card....must do a wedding card using the Bouquet stamp! I colored the image with Copic markers and was able to get into those tiny little spaces so easily using the Sketch markers. Ellen's got em' on their way so head on over to her store to stock up. Again, I used an Ornare template to make some swirls and then played dot to dot with a Copic Silver Spica Pen. You NEEEED these glitter pens, I'd go ahead and get the entire set cuz you'll want them all!. To finish off the bouquet I placed a white decorative pearl in the center of the bow. Papers by Memory Box and also available at Ellen's store. May Arts ribbon. Cupcakes anyone? Are you needing a cupcake? Or four? 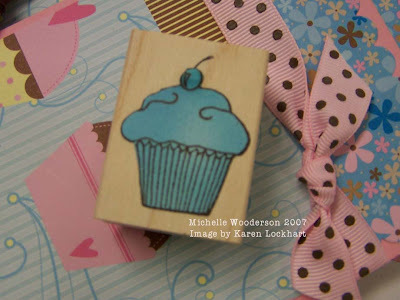 This cute little morslet of a pocket card uses Karen Lockhart's beloved Cupcake stamp. Doesn't she make good cupcakes???? I again colored the image with Copic markers and then used the Copic Silver Glitter Pen to make a pink, foil cupcake liner. That little sucker sparkles!! The pink frosting is really pink flocking.....makes the perfect fluffy frosting. Get yours at Ellen's, she's our girl! More Ornare swirlies, Memory Box paper and 4 pink decorative pearls in the corners. May Arts ribbon. And here's the inside of one of the Cupcake card. I finished it off with a little insert and tap. Sentiment from the Lockhart collection. If you look closely, you'll notice that the two green flaps that are folded up have little notches cut. I just measured in about 1/4" at the top centers of each side and snipped a notch down to the bottom at an angle. This allows space for the ribbon and the card to close nicely. I just eye balled it so no need to measure unless you're going to get all persnickity about getting that ruler out. Go ahead, I know some of you will. LOL! Enjoy and let me know if you make one.....send me a link to your pocket card, I'd love to see your version. Ever have those days where you could eat 20 cupcakes? I have them more often than I'd like to admit! LOL! I just wished carrots tasted as good! 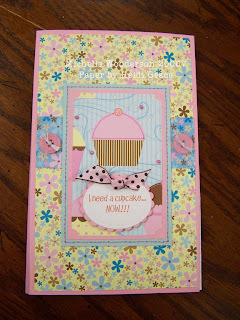 While on vacation, my sister and I fought over this cupcake paper at the local scrapbook store, we liked it so much. Good thing we found lots of it cuz we both stocked up! She told me about this card she saw that said *I need a cupcake.....now! * So I knew exactly what I wanted to make with the papers when I got home to my craft room. So here are my designs. This first photo are mini composition books that I found at Wal Mart. 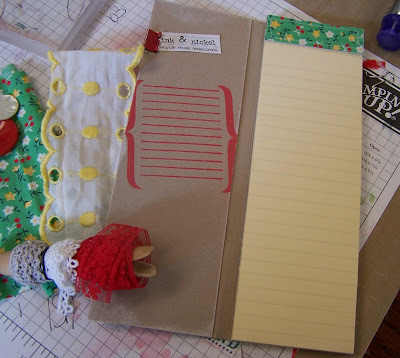 I added the paper to the front and back of the journals with a tape runner then tied on some fun ribbon. The fun sentiment was printed on my computer in brown ink. Then I die cut and embossed ovals with my Spellbinder's Wizard and Nestability Die Templates. 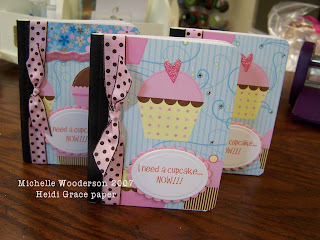 I added a die cut scallop as a mat and adhered the ovals to the books with Stampin' Up! dimensionals. The paper is by Heidi Grace by the way. These will be fun little books to give to all my teacher friends. I might leave them on their desks after a day of subbing at the high school. Those days are SOOOOOOO cupcake worthy, let me tell ya!! This next book is an altered junior notepad. I can't tell you how many of these I've made in the day.....okay, okay LOTS! These are one of my best sellers that my friends purchase from me too. They always go quickly when I show up with my goody basket. Again, I adhered patterned paper and another die cut and embossed scallop. These notepads measure 5" x 8" with a front cover that opens up. I fold the inside and adhere it with sticky tape to create a pocket. And these are some fun cards I made in assembly line fashion. The bottom cupcake patterned paper is cut into 4" x 4" squares so that I could get nine pieces from one sheet of 12" x 12" card stock. The top flowery paper is a portion of a scallop cut rectangle. I cut one with my Spellbinder die and then cut it into two pieces. Ribbon is from May Arts, gotta love those polka dots. 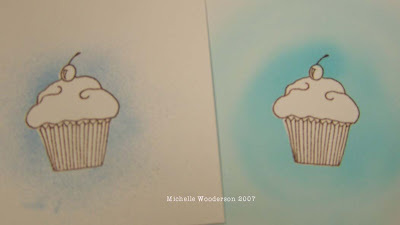 Sentiment says Happy Cupcake Day and is from the Karen Lockhart collection. Anybody else out there LOVE cupcakes? Let me know your stories!! Today is a very exciting day at our house! If you have any pre-teen daughters, you know what I'm talking about.......HIGH SCHOOL MUSICAL 2 IS TONIGHT!!!!!!!! We have been waiting all summer and tonight's the night. My girls are having 4 friends over for movie night so I have some fun things planned, which you'll see at the end of the post....don't peek yet, you gotta see the Wizard demo first!! 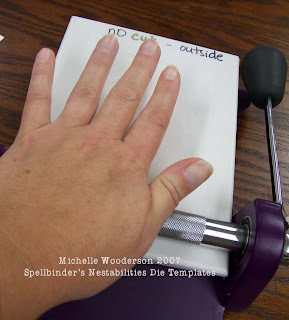 Many of you have been asking what kind of die cutting machine works best for the Spellbinder's Nestabilitiy Dies. Since working with the Spellbinder's Wizard, I have to say that THIS is the machine I recommend. My only other experience with die machines is the Cuttlebug. I like how it works just fine but there are a few drawbacks to my Cuttlebug. For one, it's a cheap enough machine money wise BUT I have spent so much money in replacement spacer plates that have broken that it was becoming a frequent trip to Michael's to get new plates. And that added up dollar wise too! And the machine is made up of a lot of plastic so there was a LOT of cracking noises going on. So why the Wizard for me? The main points that sold me on the Wizard are it's durability and that it is truly a universal machine. The Wizard is the only all metal machine on the market with NO PLASTIC and it accepts any other dies on the market! That means that this machine is gonna hold up for the long haul. The pressure in the Wizard is 3,000 pounds as the paper and die pass through the rollers. That's a LOT of pressure and it helps tremendously when embossing too. The embossed edges are crisp and clean and look STELLAR!! And you can also do things like flatten bottle caps, how cool is that! I couldn't believe it but it works!!!!! And the plates are very thick and durable, they WILL NOT crack, no way. The system works like a ratchet tool.....you slide your plates in and crank it back and forth, feeding the plates through the machine. And it works for both left and right handed people. The Wizards are available through Ellen's online store, along with the Nestability Dies and some other fun Spellbinder's Dies too. It is well worth the price if you are looking for a new machine. Now onto my photos. 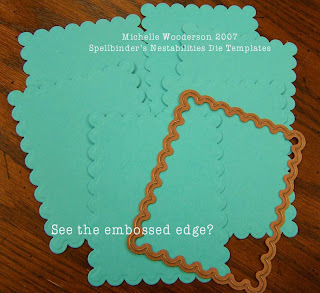 I wanted to show you a few steps as to how to cut and emboss with the Spellbinder's Wizard and Nestability Die Templates. This first photo shows you how to create a *sandwich* with the various plates. You will hear me talk about sandwiches a lot and I'm not referring to your favorite PB&J. A sandwich is the way you layer your dies before placing them into the Wizard. 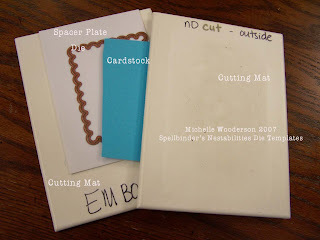 To cut a shape (I'm using a scallop rectangle Nestability Die Template for this demo), here's the first sandwich layers you'll need: Starting with the bottom layer, you'll need the Cutting Mat, the Spacer Plate, the metal Die(cutting edge UP), cardstock, and the other Cutting Mat. See photo labels for a better visual. You sandwich this all together. You with me so far? Then you place this sandwich on the flat purple surface of the Wizard. To get the sandwich to feed through the *wringers* (think old washing machine), you slide the sandwich into the wringer bars and then use the palm of your hand to manually turn the wringers. This catches the end of the sandwich and starts to feed it through. It's the slickest trick and works every time. The sandwich will go in about an inch and then you can work the handle back and forth until the sandwich slides out. Let me say that this sandwich will shoot out like like a cork gun if you're not careful. There is so much pressure that you need to be sure to hold the sandwich as it comes out. What you'll have when you open your sandwich is your cardstock cut with the shape of the die. 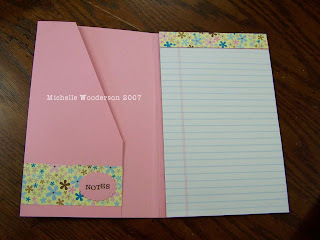 You can peel away the outter scrap of cardstock and discard. There you have it, your die cut shape. If you don't want to emboss your shape, you are done. Simply poke the shape out of the die and continue with your project. 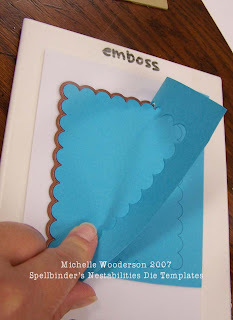 But if you want to emboss your shaped cardstock also, here's the next step of sandwich making. Anyone getting hungry yet? Remove the white, thin spacer plate and grab the tan rubber mat. Here's the layers starting with the bottom layer: Thick Cutting Mat, Metal die with cardstock still in it (cutting edge UP), Tan Rubber Mat, the other Thick Cutting Mat. Make your sandwich and insert into the Wizard as I've shown above. When you're all done, you'll have some fun cut and embossed rectangles like the ones I've done below. 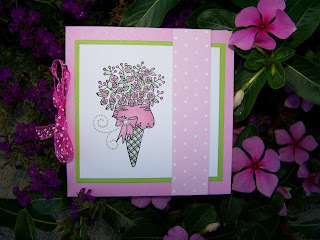 I LOVE, LOVE, LOVE the combination of cutting and embossing! So there you have it! It's easy peasy once you've done it a few times. I also wanted to show you how I store my metal die templates. This photo below shows two sets of dies housed in one CD case. Each side of the CD case can store an entire set of dies. This means 5-6 dies on each side!! I use a magnet strip to hold them all in place. Try storing ten big punches in ONE CD CASE! This photo below shows ALL of my sets of dies stored in ONE small metal basket! That's 50 or 60 dies all in one little basket!! I can't believe it hardly but it's true.....the storage factor HAS to sell you on these dies girls! Try storing 50-60 hand held punches. I know I don't have the room for that kind of storage!! Well, I hope you will benefit from the tutorial of how to operate the Wizard and make Wizard Sandwiches!! Have fun and ask me any questions, I love to help! Now onto my High School Musical project. Here's what I made with all of those scallop cut and embossed cardstock shapes. They are movie passes that are attached to a blue lanyard. I got the lanyards for free at Walmart. 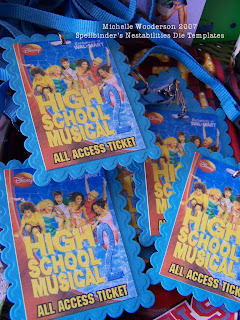 They were giving them away to promote HSM2 and had the little tickets attached. But at my Walmart they only had ONE ticket left. So I got the freebie lanyards and color copied the tickets at home onto white cardstock. I cut them out and adhered them to my blue recrangle scallop shapes. Then I attached them to the lanyards. 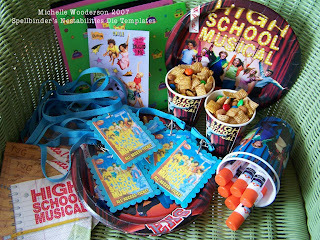 I'm also going to cut some more scallop shapes in fun colors and let the party girls cut out magazine photos of the HSM2 cast, glue them on and then they'll have trading cards to attach to their lanyards too!! How fun, I can't wait! Here's the ensemble of party decorations that I'll set up later today before the girls get home from school. We'll do the craft, then eat pizza and we'll have snacks and popcorn during the movie. I'm going to be in my stamp room but will probably be watching the movie too! By osmosis of the tv being on all day, I absorb all of these shows..so now I'm curious to see it too!! Now I know what you're all thinking so I'll just answer your question now. 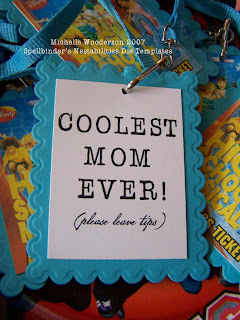 YES, I AM THE COOLEST MOM EVER!!!!!!!!! Bwa ha ha ha!! I think I'll wear my lanyard tonight too!! Here's the recipe for the yummy party mix that's shown in the party ensemble photo. I make this all the time for school parties, teachers, holidays. The kids LOVE it! Melt margarine, syrup and brown sugar in microwave for 1-2 minutes. Add baking soda and stir. Pour over cereals. Stir and cook in microwave for 3 minutes. Pour onto waxed paper and let cool. Add ½ bag of M & M’s and ½ jar of peanuts. I usually double the recipe so that I can use up all the M & M's and peanuts. Enjoy!! Note: Use a glass dish if possible, as the liquid mixture gets really hot and will melt your plastic bowls.....trust me. And you know what??? With Stampin' Ups die cut mini catalog sets, I am saving the "negatives" of the rubber sheet, as I thought they would make a great template for some of the shapes to use with the air brush!!!(e.g. the Xmas tree) What do you think? ? ? !!! Well Diane, I think that's a STELLAR idea! Diane is talking about the SU! mini catalog sets this go round.....they come already die cut so they leave a nice negative image on the scrap rubber. You could place these down on your cardstock, airbrush in the basic shape and then stamp the image in a darker color over the airbrushed portion. Too bad mine got thrown in the bottom of the trash can yesterday.....and have tomatoe and zucchini peelings all over them. I ain't diggin' 'em out! Thanks for the tip though Diane, I will save my next ones! Edited: Beth from New York(Hi Bethie!) asks "Hey Mish - do the cans cost a lot of money? How much is the system and where can you buy it? " You can purchase the entire Copic Air Brushing Sytem, refills and markers at Ellen Hutson's online store. The starter system is $61.49 and comes with everything you need except markers. The markers can be purchased in sets of wonderful colors that Ellen has hand selected or you can purchase markers separately for $4.99. I've been using my Copic Air Brushing System and I must admit that I LOVE IT!! I know this may be a new product for you so I'm going to answer some questions I know you might have. I can bet you're asking these questions: what is it, why do I need it, and what do I do with it? Good questions, right? Well I've done a comparison so that I can answer some of those questions. You may be familiar with the hand held Air Art Tool that uses a brush tip marker and quick bursts of air to force the color onto the paper. 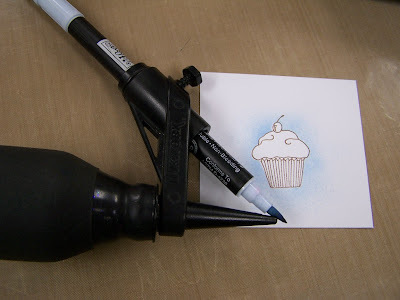 I loved this tool......until I discovered the Copic Air Brushing System! For the sample below, I masked the cupcake image using Eclipse Masking Tape. Then I did about 25 bursts by hand and then I got tuckered out! This tool requires you to do all the spraying by hand. And if you zoom in on the photo below, you'll see that the finished effect is dots of uneven ink. It's an okay look......but wait til you see the next photo! Here's a sample done using the Copic Air Brushing System and a Sketch marker. Zoom in on the photo below and you'll see a very smooth, airy finish. This is due to the pressurized air that comes out of the air brush system. You have two cans....one that is the air and one that is the air adaptor that holds the air just before you press *the go button* so to speak. After you get the hoses all attached and insert the marker, you are ready to go. After a couple times of reading the directions, I got it down (which is good for me, the *non-instruction reader kind of gal*). You then are able to press the button and the ink sprays out effortlessly and very even with only the physical effort of pushing a button, not continous squeezing that makes your hands hurt. I applied the spray in a circular motion on this sample, but you can go back and forth or whichever way you want. Doesn't it look like this cupcake is just floating in space...such a fluffy little thing! It's by Karen Lockhart, by the way........you gotta love a cute cupcake! Here's the samples side by side, can you see the difference now? Okay, so you see it but you're still asking why you need it right? Well, for me the Air Brush System is another fun tool for creating fun effects on my cards. And a girl can never have too many fun tools right? Another reason I love the Air Brush Tool is that by using the Copic markers, I can continue to refill my markers so that they never dry out. And once you get the mechanics down, it's SO easy to use. You can make sky scapes, rainbows, stripes, water, shading.......the possibilities are endless! I can't wait to experiment more with mine! Let me know if you get one, I will be glad to help you out!! This is a finished card made with the airbrushed image. I used this fun layout again that has the scallop top. I cut a rectangle with a Spellbinder's Rectangle Scallop die, using just a portion for the top of the card. The bottom portion of patterned paper is a 4" x 4" square......you can get 9 pieces from one sheet of cardstock. 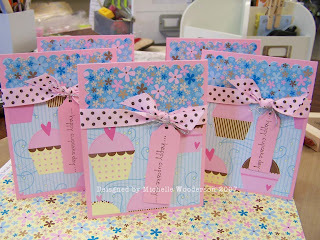 Don't you just love this cupcake paper!? 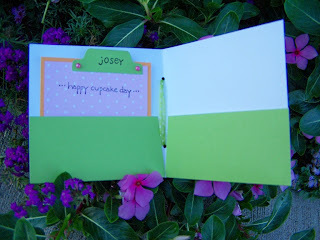 You cover the seams by tying some fun ribbon around the entire card front. The main image was adhered with Stampin' Up! dimensionals to simulate the look of a tag hanging from the ribbon. Tip of the day: Save your cutout masking images by placing them on the corresponding stamp image. No need to cut out that same image over and over because the Eclipse Masking Tape stays tacky. Talk about pink right?? While on vacation, I took along my Crafty Secrets stamps, a black ink pad and a few Copic markers. So I spent a little time creating some collage images. I used the French Mail and Cherub set from Crafty Secrets. I wanted to create a *postcard* feel these these cards and these CS sets work great for that look. I also bought some new pink and black Anna Griffin patterned paper at Archiver's while in Colorado Springs, I love it! And while at Archiver's I noticed that scallops were everywhere. I mean everywhere....on paper, embellishments, stickers, stamps. 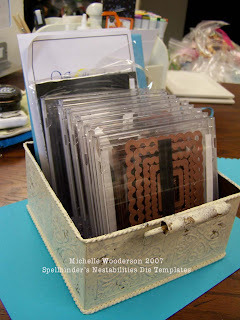 This is where my handy dandy Spellbinder's Nestabilities scallop die cut templates came in handy. I used full embossed square on the first card and just a snippet of a black scallop on the second card. I love that the embossing adds enough detail that you don't really need to mat your images again. They stand out enough without any additional card stock matting. Images were colored with Copic pink markers. Notice too that I used a light pink mist of Copic airbrushing on both cards too. I think this added just the right airy touch to these romantic cards. Stay tuned for more tips on airbrushing with Copic Sketch markers soon. Ink & Nickel creations.....Hi Pine! 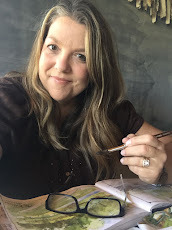 My dear friend Heather Nichols, also known as Pine in the stamping world, gave me a few little snippets of some vintage goodies while at CHA. She and her friend Brianna have started this fun venture called Ink and Nickel. They collect vintage items from garage sales, estate sales and flea markets and refurbish them into fun little kits to use on stamping, scrapbooking and home decor projects. I bet they've even dumpster dived a few times! Their motto is *recycle, reuse, redecorate*. 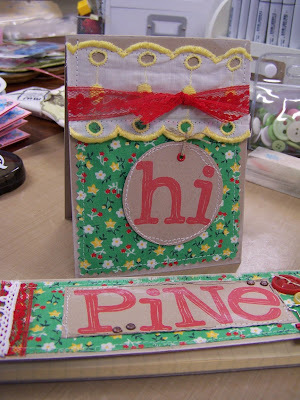 So I thought I would make Pine a little notebook and card using some of her goodies. My little package included vintage fabric, ribbon, eyelet lace (all on that cute clothespin), and buttons. These are some more of those junior notepads that I had cut in half at my local printing place. They are the perfect size for your purse or work bag and make great shopping lists. I use mine to keep track of my blog post supply lists. 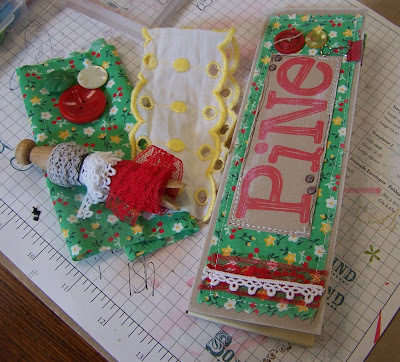 All the goodies are from Pine, the paper is Pine's favorite Stampin' Up! Kraft card stock. White ink on the edges (another Pine fave) and the big alphabet is from Autumn Leaves. I got my set at Archiver's. Tip of the day: I stitched on the vintage fabric with my sewing machine and frayed all the edges by taking off several rows of string around the stitching. To cover the stitching on the inside cover of the notebook, I adhered another piece of Kraft colored cardstock. Be sure to check out Pine's website HERE! From there you can head to her ETSY website where they sell all kinds of cute, homemade stuff! Check back often cuz I know Piney's going junkin' again soon! I really love how this card turned out. I bought this new K & Company paper while on vacation and just fell in love with it! And while at Archiver's I saw scallops everywhere, they are a hot item! So when I got home, I scurried to my stamp room to make a creation. I colored my new Lockhart image called Garden Angel with my Copic markers. 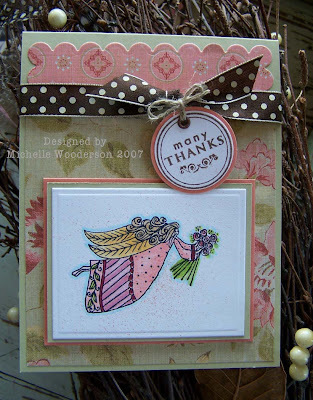 I love all the details that Karen puts into her Angel stamps, they are just beautiful. And when using Copic Sketch markers, you can really ink up those tiny details well. The point of the marker stays pointy which means you don't end up with frayed and nubby markers. BONUS!! You gotta love the quality of these markers. The only shading I did on the Angel image was by simply layering on more of one color around the edges. Building upon one color creates just the right amount of depth I'm looking for on this card. The main Angel image is cut and embossed with a Spellbinder's Nestabilities rectangle die, then mounted on two other colored rectangles. I wanted to be able to show off the beautiful patterned paper so I kept the layers simple. I love the embossing though, it finishes off the edges just right! 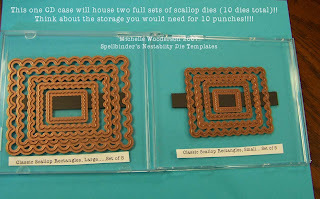 Now for those scallops that I love so much.....I cut a scallop rectangle in a coordinating pattern for the top portion of the card using a scallop rectangle Spellbinders die template. I just trimmed off about 1" of the rectangle and matched it up to the other paper. I *sealed* the two edges of pattern paper by tying a ribbon around the card front, I LOVE that look!! And notice how I chose a ribbon that totally contrasts my paper....I have been doing this lately and I love the look. Simply choose a ribbon that's a little *mis-matchy* and the look is STELLAR! 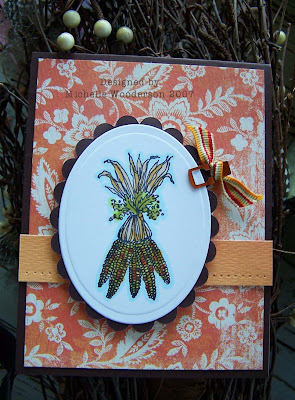 For the round tag, I used a Papertrey sentiment and circle. Punched them out and mounted on another colored circle. Attached a brown eyelet then attached the tag to the ribbon with linen thread. What a perfect finishing touch! Remember my card idea book that I talk about? Well this card layout will be going into that book because it's for sure to become a favorite. I can't wait to make more cards using this layout. I hope you give it a try...leave a comment and link me to your creations! I love to hear from you all....and thank you for leaving comments, it really lets me know that I have some great stamping friends!!! Tip of the day: Don't worry about things being so *matchy matchy* on your projects. I actually prefer a little tidbit that is mismatched slightly, it creates a bit of quirkiness and fun and really catches the viewers eye. So next time you're selecting papers or ribbon, throw a few mismatched patterns together and see what you come up with. Keep within a few close color ranges but don't worry that all your blues match or that you mix a polka dot with a paisley. It's ALL good! Variety is the spice of life, ya know! From Ellen's online store: Lockhart Garden Angel, Spellbinder's Nestabilities Die Templates, Copic Markers and air brushing system.